Even if you only dabble in growing your own vegetables, chances are that you grow a few radish here and there. Few crops are as reliable or quick, speeding from sowing to serving in as little as three weeks. Our garden alternates between the mild, multi-coloured globe shaped radish that were my first ever crop and the hotter, torpedo shaped french breakfast radish. This raita was inspired by a memorable keralan dinner cooked for us by friends, inspired in turn by their recent trip to India. All of the food was vegetarian and included a dish that looked like a regular cucumber yogurt raita. The first taste was cooling yogurt and cucumber, but swiftly followed by an unexpected and warming kick of ginger. The same concept works equally well with the modest radish, which is also much easier to grow in the UK (though I am tempted to have a bash at propogating supermarket ginger indoors). Like tzatziki and cucumber raita, this dish doesn’t keep terribly elegantly. 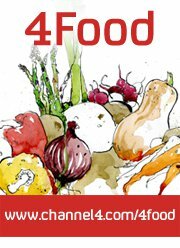 It’s not that it goes off overly quickly, just that the vegetables steadily seep water which separates from the yogurt. You can easily drain off the excess liquid give it a good stir, but as the whole thing only takes five minutes to pull together I just tend to make a batch as I need it. We use this as an accompaniment to veggie dishes (like the spicy chickpeas in the photo), simply cooked fish and barbecued or griddled meats. If you fancy it you can add some finely chopped ginger for extra heat. Half a cup of finely chopped radish. Refrigerate for 30 minutes to an hour before serving to let the flavours meld. This will store in the refrigerator for two to three days but is likely to separate. Carefully pour off any water that has leached out and give the remainder a good stir. I bet that’s really good. My trouble is I’ve never managed to grow successful radishes – the slugs always seem to get to them first and they end up with so many holes in them I don’t really fancy eating them. Haven’t tired for three years or so – maybe time to try again. 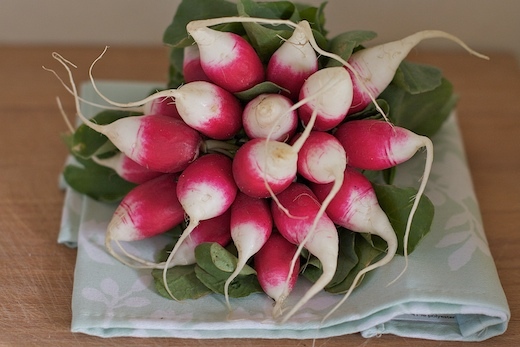 Oh your radish photo is stunning… want to chomp on the screen! I need to give these radishes a try. Hoping it’s not too late in the year to start. Shauna – go for it! You’ll easily get another batch or two of radish in over the summer and even once the weather gets a bit colder they’ll still grow, albeit taking twice as long. My radish growing mistake tends to be not thinning them enough so that the plants are growing too close together and I end up with comedy shaped radishes. The spicy raita sounds great. I love the idea of growing your own ginger indoors! I stuck some in the ground before I left Sydney, but I have no idea whether it’s still growing in my parents’ garden. Apparently you can grow cinnamon as a houseplant too, which sounds lovely and exotic. 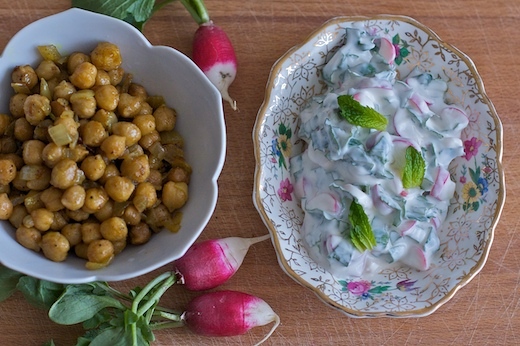 Lovely recipe Sophie, I’ve never thought to turn radishes into a raita, but I like the idea. I also like the look of your spicy chickpeas, they seem deliciously spice encrusted! I just love raita, it’s so versatile. I’ve also made a carrot version once that came out well too. Hi Sophie! I had to leave a comment to say thank you for a very enjoyable Monday night! I have been browsing your blog since I came home from work, and I am going to sleep inspired, and very hungry!! I love this Raita recipe. Radish is one of my favourite veggies, and I think they are so overlooked. So full of flavour. I love how they take centre stage here. I can just imagine sitting dunking steaming hot pitta breads into this Raita and being happy as can be! Every year I always say to myself that I am going to attempt to grow some Radish. I have limited space as I live in central London, but have nice big windows which could take a pretty sizeable window box. So no excuses this year!